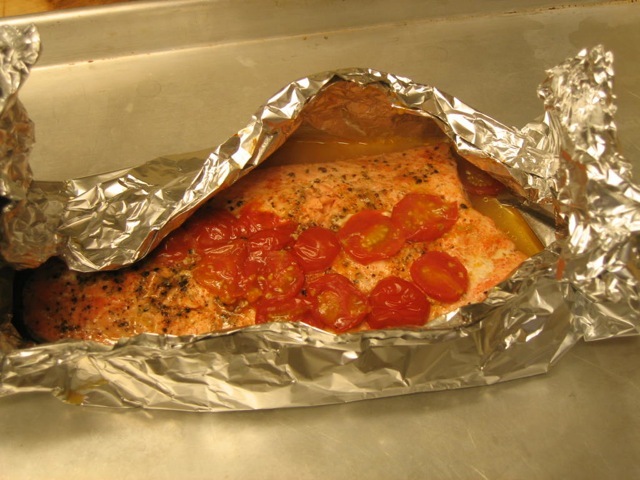 Place a (preferably wild caught or sustainably farmed) salmon fillet in some parchment or foil. Toss on some sliced cherry tomatoes, seasonings and a splash of white wine and a drizzle of olive oil. Fold the foil or paper into a sealed pouch with room for steam. Pop this in a hot oven (375 or so) for twenty or thirty minutes while you boil up some noodles. 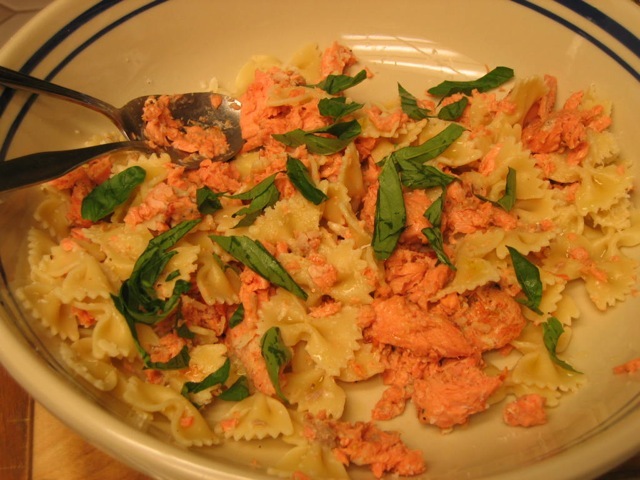 When the fish is flaky and cooked, chop it into chunks and toss it in with the drained pasta. Then add another drizzle of oil and melt some butter (more than you think you'll need) in the hot noodles too. Grate fresh parmesan cheese (I like lots) and add some basil from the garden. 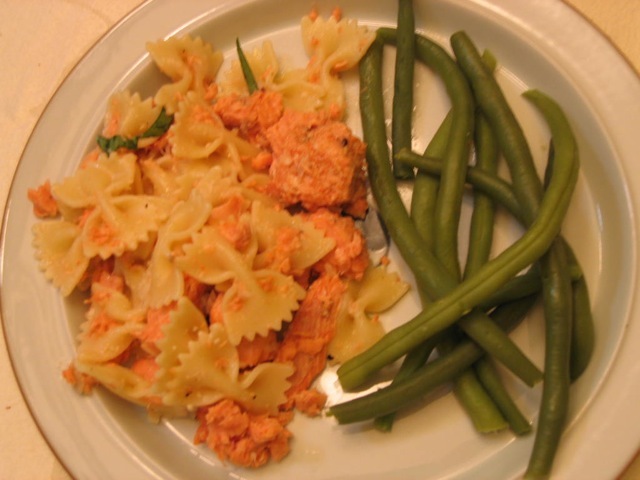 Green beans on the side and you're good to go for an easy summer dinner. Right now, I just need things to be simple. Pasta and fish or meat is simple. I love fish and chips. There, I've said it. And in defense of this fried food, let me say that when properly cooked, fish and chips do not have to be soggy and greasy. Here's the trick: the hot oil simply must be hot enough to fry the fish quickly and vigorously, but not so hot that it spatters and creates a fire hazard! Use a frying oil that has a low "smoke point", meaning it comes up to frying temperature quickly, such as grape seed, vegetable or canola oil (not olive oil). To test if the oil is hot enough, drop a tiny bit of batter into the oil. If it sinks and stays there, it is not yet hot enough. If it immediately fries to a crisp or explodes, too hot! What you want is for the batter to sink, then immediately rise to the surface and stay there while it turns golden and bubbles away merrily. In a medium size bowl, combine the flour, beer and optional cayenne pepper and whisk until blended. Set aside for up to an hour. Pat the fish filets dry, then dredge lightly in corn starch. Then dredge and cover the fish with the batter and (very carefully so as not to splash the hot oil!) place into the hot oil. Turn carefully when golden on one side. When completely golden brown, remove the fish to a paper towel and allow to drain and cool a bit. Serve while still hot, with the cooked potato wedges. 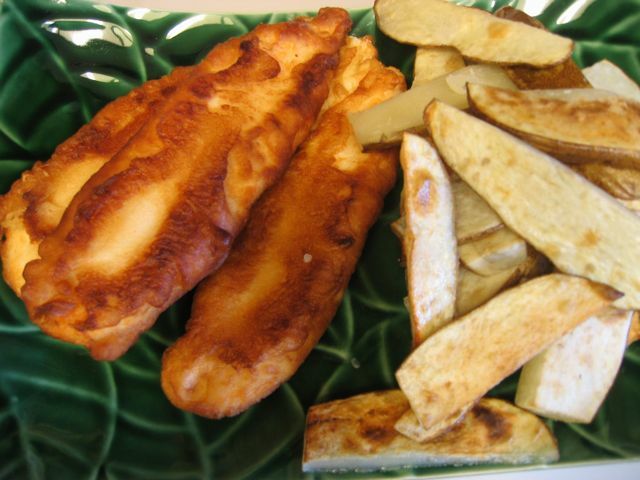 Serve the fish with fresh lemon, tartar sauce or cider vinegar. The holiday season is upon us, and thoughts turn to special meals and food to share with family and friends. Shrimp cocktail is an incredibly easy to prepare and delicious appetizer that can be served cold at your next gathering. The shrimp are brined before a quick broil in the oven, chilled, and then served with a sauce that has a little kick to it. I find that this recipe strongly enhances the flavor of the shrimp, and is nicely complemented by the zesty sauce. Alton Brown is the source for this recipe, although I did not use the Old Bay seasoning as he suggests. I served the shrimp with the shell on, although next time I will probably remove the shells (after cooking and chilling) before serving. NOTE: Brining and cooking the shrimp IN their shells is the secret to bringing out the wonderful flavopr of the shrimp. "Devein" the shrimp by slicing carefully through the shell along the back and running cool water to remove the intestinal tract. Leave the shells on the shrimp. While shrimp are brining, place all cocktail sauce ingredients into a food processor and pulse until smooth. Refrigerate cocktail sauce until ready to serve. Place shrimp onto a very hot sheet pan and return to broiler immediately. 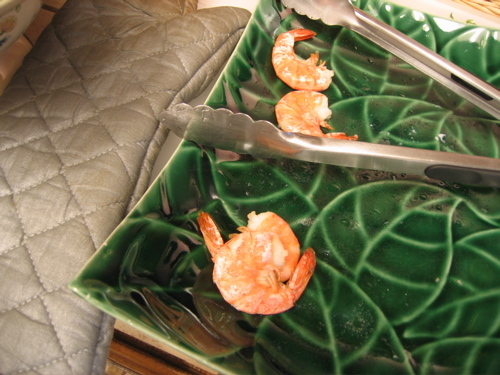 After 2 minutes, turn the shrimp with a pair of tongs. Return the shrimp to broiler for 1 minute. Transfer to a cold cookie sheet and refrigerate immediately OR place in a pre-chilled metal bowl in the freezer until chiiled through (but not frozen). Once shrimp have chilled, place them on a serving platter with the bowl of sauce, or serve in individual small bowls with sauce as desired. The health benefits and culinary delights of eating fish are many. But is it safe? Have water pollution and over-crowded farm-fishing compromised all fish equally? And what about the problems of "by-catch", when other creatures such as dolphins, non-target fish and birds get caught and killed along with the rest of the catch? Here's a resource that aims to help the consumer make informed choices about what to buy and eat. Oceans Alive has created a list of Best and Worst Seafood Choices to consider, in terms of environmental and health impact. The "fish to avoid" list bears careful study. For example, wild striped bass is considered more risky from contaminants than farmed striped bass. (In fact, farmed striped bass may actually be a hybrid fish.) In addition, recommendations may vary depending upon the age and gender of the person eating the fish, since young children or pregnant women are more vulnerable to the long term effects of contaminants in the fish. And while one fish may rate as "healthier" than another, it may rate poorly in terms of environmental impact of the way it is caught. As always, there are many facets to consider before you head to the fish monger. I wonder what kind of striped bass I just cooked? Wild or farmed? Next time I'll know what to ask before I buy. While you are there, you can download a Pocket Seafood Selector to take with you, and read about healthful fish oil supplements. If nothing else, following the recommendations to choose from a variety of fish should be an enriching experience. Last week I saw the sign at Whole Foods market: Celebrate Chinese New Year by serving whole fish, to symbolize prosperity and abundance for the coming year. That sounced like a great opportunity to cook and serve a whole fish, as I had recently seen on Helen's blog, Beyond Salmon. 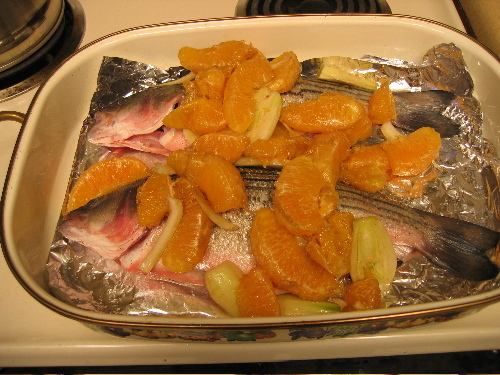 I took liberties, however, and substituted striped bass for sea bream in her recipe for Sea Bream with Fennel and Oranges. It was such a beautiful picture, and I love fennel and oranges, so I just had to give it a try, albeit with striped bass. I did study Helen's helpful chart about fish types and hoped that my slightly firm bass would be a suitable substitution. I decided it would be OK! The result was a nicely cooked couple of fish, with the oranges and fennel slightly browned. Although I originally planned to serve the fish whole, this is where my nerve failed me. Some of my family members, (who shall remain nameless), are decidedly finicky eaters, and while I find a whole fish presentation elegant...I would have been in the minority. So I pulled off the skin, heads, tails, etc. and removed what bones I could. Then I placed the resultant nicely cooked fish on each plate, and covered them up with the oranges and fennel. This disguise did well at masking the less than intact fillets on the plate. I will spare you the pictures. The result was tasty fish, although I was surprised that the orange and fennel was not enthusiastically received. I learned that while I love fennel, I prefer it roasted more thoroughly. Nevertheless, I was proud that I stretched a bit beyond my comfort level in the kitchen and tried something new--one of my new year's resolutions. The wine? 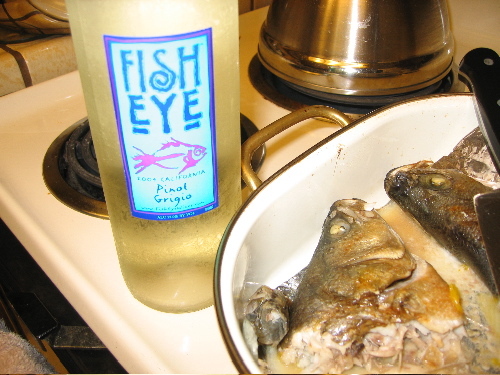 Fish Eye Pinot Grigio was just right. Here's looking at you, kid. Have a prosperous new year!